"Let them fight with bombs and guns to shed our blood, I gonna fight with love!" What a statement to start an album with! 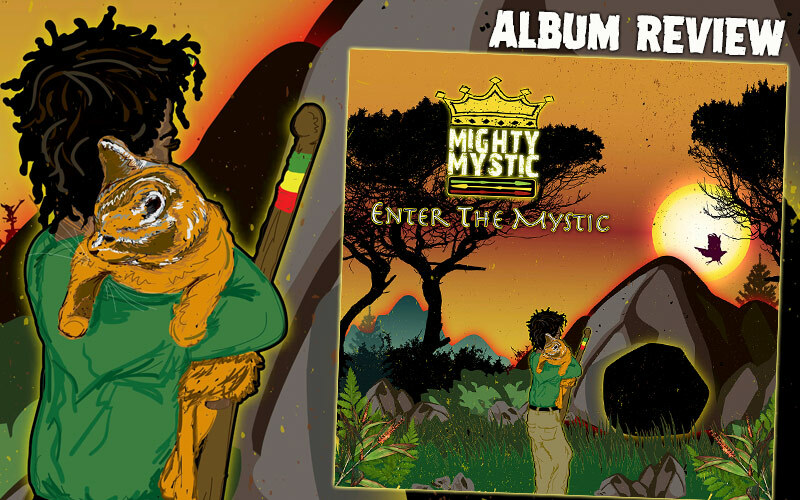 After his debut Wake Up The World (2010), Concrete World (2014) and The Art Of Balance (2016), Kevin Mark Holness aka Mighty Mystic now introduces Enter The Mystic with a bang, accompanied by an astonishing amount of sponsored posts on social media. You thus might have already encountered the release with the lonesome wanderer holding a lion cub and walking toward a cave in the sunset. The Jamaican-born artist living in Boston has established a musical flavour he calls Hard Roots, so be prepared for some heavy rockin' guitars, rolling drums and roaring vocals! His fourth release is entirely self-produced, except Sell Your Soul (by Green Lion Crew), Jumper (by his elder brother Stephen "Thunder" Holness) and Like A Souljah (by King I-Vier & Loud City). The introductory piece Fighting With Love is, for me, the strongest of the release, a powerful wake-up call in which the musicians Salvador Pineda (drums), Sagar Gowda (bass), Jens Sweeting (keys), Itamar Edelman (guitar) and Tim Phillips (additional guitars, percussion & keyboards) convincingly display their instrumental skills. Another song that really touches me is If The World Should End Today, a ballad livicated to the one the singer wants to spend his life with. Slugs and serpents are the subject of the next song, and instead of love, Salt is the weapon of choice this time. While both Hungry Man's Anthem and the title track Enter The Mystic have well-conceived lyrics, the songs itself don't really get under my skin - the Roots are in both cases a bit too hard for my liking. False Trumpet, however, is a great politically motivated track, a sharp criticism of Trump's policy of walls and hatred. "Show your middlefinger to the trumpet!" Likewise, Rock A Bye treats the serious issue of a mother losing her son to senseless violence, and in this case, the artists' rough delivery is a good accompaniement of the song's theme. In other instances, Mighty Mystic's voice is neither completely on point nor versatile (such as Where There Is One or Boomerang), and a very special mention deserves backing vocalist Virginia Alves who smoothes out a few of these bumps and enriches most tracks with her outstanding vocal skills. The album finishes with Only A Ninja, featuring the same Stephen "Thunder" Holness who is also co-producer of this tune. Overall, Enter The Mystic is an album made interesting by the singer's choice of thematic issues treated, and, for the fans of it, by the signature, heavily rock-infused sound the artist has continued to develop over the last years. Reducing the quantity of songs would have done no harm (both Tribe Say and Like A Souljah could easily have been left out), but with his critical, reflective mind, Mighty Mystic will certainly be a force to reckon with in the future!